Udupi: August 31, 2015: An eight-day cultural programme, ‘Ashtadinotsava’, will be held from September 1 to mark the Sri Krishna Janmashtami festival at 800-year-old Sri Krishna temple here. They will be held at the Rajangana hall at 7.30 p.m, and will begin with ‘Nage Habba’ (humour fest) by Richard Lewis and Mysuru Anand and party. Vidwan Shankar Aiyyar Thanjavur and Jayant and party will perform a flute recital on September 2. The Gili Gili Magic troupe would stage a magic show on September 4, said Vidyavallabha Tirtha Swami of Paryaya Kaniyur Math, at a press conference on Saturday. On September 4, the Gana Nritya Academy of Mangaluru would perform ‘Nritya Vaibhava’. A devotional programme ‘Bhakti Sangeet’ by Bharat Sundar and team would be held on September 5. There would be ‘huli vesha’ and other folk dance competitions at Rajangana at 6 p.m. on September 6. The Sri Krishna Janmashtami and the Vittal Pindi (Sri Krishna Leelotsava) would be celebrated at the Sri Krishna Temple on September 5 and 6, respectively. The Gopalakrishna Yakshagana Puppetry Troupe would give a puppetry show ‘Narakasura Vadhe’ and ‘Garuda Garvabhanga’ at 6 p.m. on September 7. This would be followed by a Yakshagana performance ‘Sri Durga Vilasa’ by Sri Mahalingeshwara Pravasi Yakshagana Mandali at 9 a.m. The cultural fest would conclude with a flute recital concert by A. Ananthapadmanabhan from Chennai on September 8. The ‘arghya pradhana’ ritual would be held at the Sri Krishna Mutt/Temple at 12.14 a.m. (moonrise) on September 5. The Vittal Pindi festival would begin in front of the mutt/temple at 3 p.m. on September 6, the seer said. 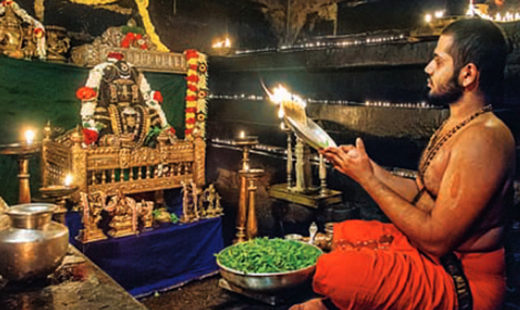 The residents of Udupi are blessed and are lucky that they can take part in the cultural and devotional activities being performed in the temple.